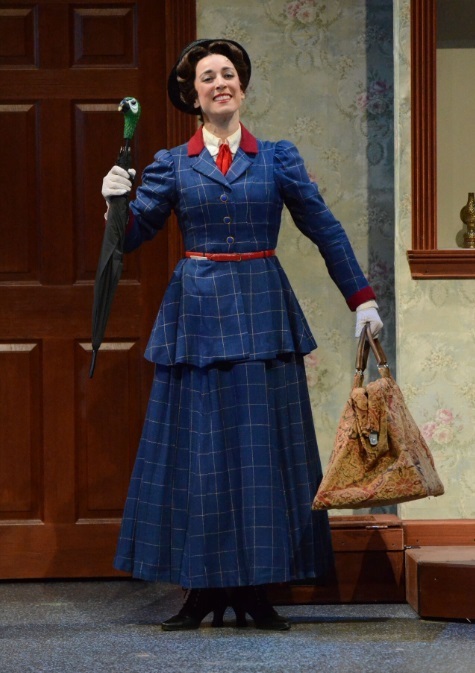 When the magical nanny Mary Poppins (Renee Kathleen Koher) first arrives at the Banks household on Cherry Tree Lane, she doesn’t fly in on a strong wind blowing from the east. Like the genie in Aladdin, she appears in a sudden puff of smoke in the middle of the living room. Your first thought, other than what a neat, theatrical trick, is that the Banks family, who witness the moment, might remark upon it. After all, it’s not something you see in your home every day. But no one does. Instead, Miss Poppins, so named because of her habit of popping in and out of the lives of the children she’s there to look after, is immediately hired, beginning the fun adventure of guiding the troublesome children, Jane and Michael Banks, into appreciating their family and becoming less troublesome in the process. Though, of course, if you saw the wonderful 2013 movie where Emma Thompson played the prickly author of the novels, P. L. Travers, you’d know that the real reason the practically perfect nanny arrived at the upper-middle-class Edwardian London home was to save Mr. Banks. 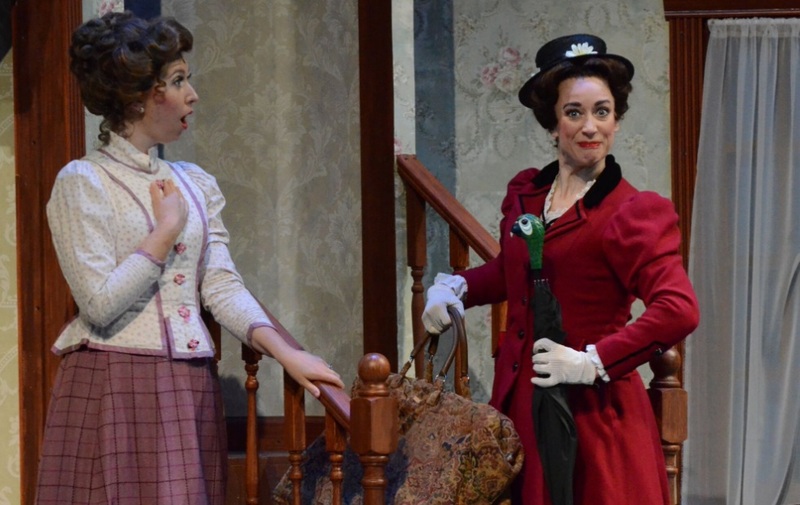 For its 100th mainstage theatre production in Peoria, like the character herself, Mary Poppins is a practically perfect choice for Arizona Broadway Theatre to present when celebrating such an important milestone. From the beginning, the overall success of ABT has always been to know its audience and produce what a valley dinner theatre audience expects. It’s doubtful that a play from either Tennessee Williams or David Mamet will ever open on the stage at West Paradise Lane in Peoria, but something like Mary Poppins that offers song, dance, and a special kind of theatrical magic that can thrill an adult as much as a child, is exactly the kind of show that should be on its menu. Your only hope is that the theatre doesn’t mess it up. Fortunately, here, that’s not the case. 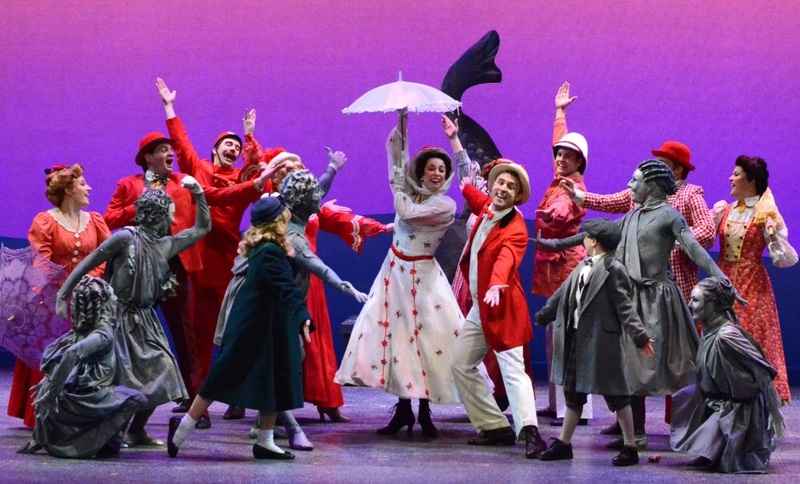 Just like Mary Poppins once her job is done, ABT’s ambitious production of the famous Disney sixties musical takes flight. Those who have never seen the stage presentation and are expecting a basic retread of the Julie Andrews film are in for a surprise. First, while much of the original score is intact, there are new songs, some written in the same vein of the Sherman Brothers style, but not quite as memorable. Plus, the characters themselves have an edge that is closer to how author Travers wrote them, rather than the likable Disney style that smoothed those rougher edges out. In fact, it was the Disneyfication of her work that made the Aussie author so upset. When in 1993 she was approached for the approval of a new stage musical, Australian born Travers, who in her later years had moved from down under and fully embraced a more British way life, insisted that whoever worked on the redevelopment of Mary Poppins for the stage had to be English. No Americans allowed. However, she passed away three years later and never saw the completed work. It’s difficult to say whether Travers would have approved of the end result, but it’s easier to predict how delighted most ABT audiences will be. And like that description of the flying nanny, being practically perfect can also apply to Koher’s performance as much as it does to the character. This is not necessarily the Mary Poppins of the Disney film. There’s a no-nonsense stern streak to Koher’s Poppins that is closer in spirit to the firmness of the nanny in the book than the gentler one presented in the movie. P. L. Travers objected to the casting of Julie Andrews in the film. She should have no reason to object to Koher. The new script was written by the man behind Downton Abbey, Julian Fellowes, and if there’s anyone qualified to write about London life during Edwardian times, it would be Fellowes. Here, Jane and Michael Banks – played on alternate performances by either Gracie Palmer and Julianne Creed as Jane, and Wyatt Chamoff and Aaron McCaskill as Michael – tend to lean on a somewhat unlikeable snobbish side. When meeting the Bird Woman (Chae Clearwood, whose rendition of Feed The Birds is a musical highlight; a great song, wonderfully sung) Michael considers her “a horrible old woman” and wonders why Mary Poppins would want anything to do with her. He even calls Bert (Chris McNiff) “dirty,” someone that would never get the approval of Mr. Banks. Plus, with an air of snotty superiority, Jane calls the Banks’ houseboy, Robertson Ay (Conner Morley) “insolent.” Even the likable Mrs. Banks (Beatrice Crosbie) who in the show is an ex-actress, not a suffragette, shows a superior attitude when talking of the necessity of a children’s nanny. “All the best people have nannies,” she tells her husband. Even though what she says at that moment sounds slightly elitist, Crosbie makes her character someone you warm to very quickly. As Mr. Banks, ABT’s ever-reliable Jamie Parnell – you may remember him in recent productions of Funny Girl, Oliver!, Jesus Christ Superstar, Sweet Charity, and Camelot – gives life to the more difficult role of the father who loses his job at the bank. Mr. Banks displays a temper that Walt Disney would never have allowed David Tomlinson to exhibit in the film, but given the pressure that the character finds himself under, not to mention a backstory regarding the horrific nanny who looked after him when he was an impressionable and frightened child, Parnell manages to make the head of the family the most real and eventually the most sympathetic character of all. 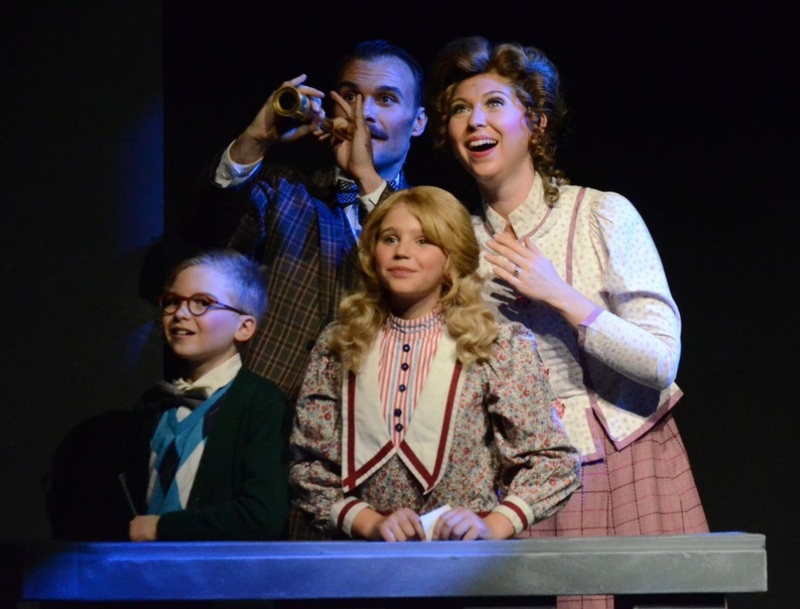 As for that horrific nanny, Miss Andrew – not in the Disney film but in the book – Kathleen Berger may be on stage for just a short time in the second act, but she leaves with the kind of indelible impression that is hard to forget. Entering the stage in a clap of thunder, she’s the villain from a British Christmas pantomime, the kind that has children either booing, or hissing, or hiding behind the safety of their seats. As Bert, the comical cockney jack-of-all-trades, Chris McNiff injects great fun into a character that is hard to explain. Like the film, you never really know anything about him, where he lives, or how it is that he even knows Mary Poppins. He even exhibits a little unexplained magic of his own during the Step in Time chimney sweep rooftop dance. Those already familiar with the stage musical may be disappointed that there’s no defying gravity moment when Bert climbs the theatre’s proscenium arch and tap dances upside down, but given the size of ABT’s wide stage, the difficulty may have proved insurmountable. 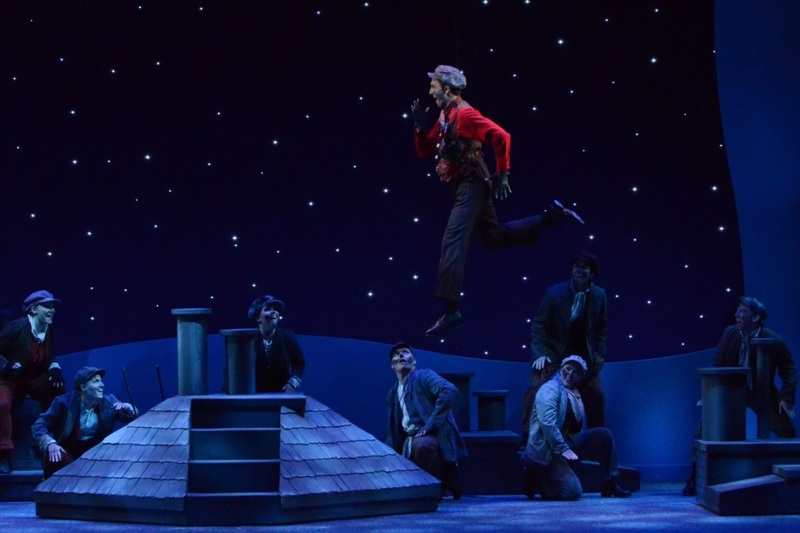 Still, when the chimney sweep’s feet leave the ground and he performs a series of backward flips while hanging in the air by wires, the sequence appears impressive; he’s a foot-stomping Peter Pan covered in chimney soot. Also impressive is Glen Sears’ layered scenic design. It begins with a painted scrim of the house on Cherry Tree Lane, which rises onto the set of the Banks’ home, which later parts to reveal the children’s wide bedroom. After that, it opens up onto the gateway to the local park. It’s only when we enter the park for a Jolly Holiday that the size of ABT’s expansive stage works against the show. Even with a cast walking and dancing from stage left to stage right, the cavernous arena is hard to fill, resulting with a curiously empty look and little atmosphere. When director Clayton Phillips’ otherwise engaging ABT production moves house after its final performance in Peoria on June 30 and starts a July run at the Herberger Theater Center in downtown Phoenix, the smaller and more enclosed stage area should make all the difference.